like me, then you watch loads of home shows that fill every slot on HGTV. But let's not forget the grandaddy of them all, This Old House. It just so happens, TOH is in the midst of its first New York City project ever! (How is that possible??) And it also just so happens that this very first NYC project is a renovation of a Brooklyn townhouse. Cool! While there are a lot of differences between their home and ours, there are a lot of similarities too. Our houses were built around the same time, have the same sort of hallway/parlor layout, etc.. If you've never been in a New York City brownstone, watching the episodes will give you a good idea of the layout of my house or any other rowhouse around here. I'm quite happy to have our renovation long over with but it's fun to watch someone else go through a little of what we did. They even have a blog (although its not that often updated). Definitely check it out if renovation + restoration is your bag. Check your local listings.  Wondering what the difference between our limestone and their brownstone? Aside from the obvious exterior differences, my house is in different neighborhood. For those outside of the area, neighborhoods are a really important distinction here. Just a few blocks one way or another is a different vibe, school district, shopping and transportation options, etc. 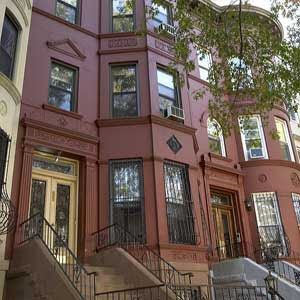 This house is in Prospect Heights which is more trendy and transitional than my very quiet but consistent Windsor Terrace (we are on opposite sides of Prospect Park). My house is a whole floor smaller (they have 4 floors, we have 3) and I don't have as big of a backyard. I'm sure there are other things as well but thats all that comes to mind right now. This Old House is where it all began for me , when we lived in our first basement apt every Saturday I would watch a dream of having a house fo my own to work on , I actually thought the program was finished at least on our listings it is , I will need to track it down now. Hey, I was meaning to write you and tell you I saw the first episode! Last week I was watching The New Yankee Workshop (I love Norm Abram) and the next show that came on was This Old House and they were doing the Prospect Heights brownstone! I was so excited and thought about you the whole time and wondered how similar your experiences were. I noticed they had a huge yard. Their house was chopped up into apartment units but I was surprised to see all the millwork detail and whatnot still intact. I will have to check the listings to see the rest of the series as I'm not sure when it's on. Seems like This Old House doesn't run regularly on my cable. Who, me a house lurker. Did you see my face pressed up to the window? I saw that episode and immediately thought of your place...especially when they showed one of the completed projects from the contractor. Yours is SO MUCH BETTER!!! Yes TOH is one of the first shows I remember showing restoration work. Very cool that they are coming to Brooklyn. They are a great looking house! I saw the first episode and thought of your renovation, also! To top it off, I had just read A Tree Grows In Brooklyn and watched a 1945 version of it I got at the library. When it was over, This Old House was on! So, I had Brooklyn on the brain this weekend! :-) Your house is lovely and it is fun to watch the other one become lovely, also. I love TOH. I completely forgot they were doing a brooklyn brownstone.I must remember to catch the next episode. I haven't seen TOH in a while- but will take a look. Bet you're glad that part of it is over for you. I admit to being a real estate junkie and have spent far too many hours checking out properties. Your kitchen remains among my favorites- looks to be very efficient. Limestone to brownstone, I love it all! The homes on the West Coast definitely do not have the same type of historical flair that I covet. Will have to keep an eye out for it! Oh, I cant wait to see this one! I love Norm and This Old House, it was one of my fav shows growing up- I did a post on in a few weeks ago too. I'm setting my DVR right now, so I can make sure to catch it. I started watching the new season last night - the house is great! I was about to swear off TOH after last season but I've reconsidered (obviously). I love watching other people in the midst of renovations; it helps to know that we're in good company and aren't completely insane when we undertake such large projects. My friend grew up in the house. It is amazing! She is now married and lives upstate and her family has moved down south. However, it is AMAZING to see a house that I have so many memories from on tv. Here's a charming article about the "behind-the-scenes" stuff that goes on.